I hope you get answers soon too. Can sympathise how frustrating it is not knowing what's wrong. Re-homing hedgehogs? Now I'm intrigued. Sounds a very uncomfortable way to go about things hon, I really hope it gives some answers. They've never asked me to binge on any food groups, but I did get the colonoscopy and then an MRI of my small bowel which seem to have cleared them so they're no longer under suspicion. If you start to feel really bad then for heaven's sake ring your doctors and ask if they can repeat your test earlier so you can get off these foods! On a lighter note, I would also like to hear about the hedgehog rehoming! Who put a ruddy hedgehog in my breadbin? 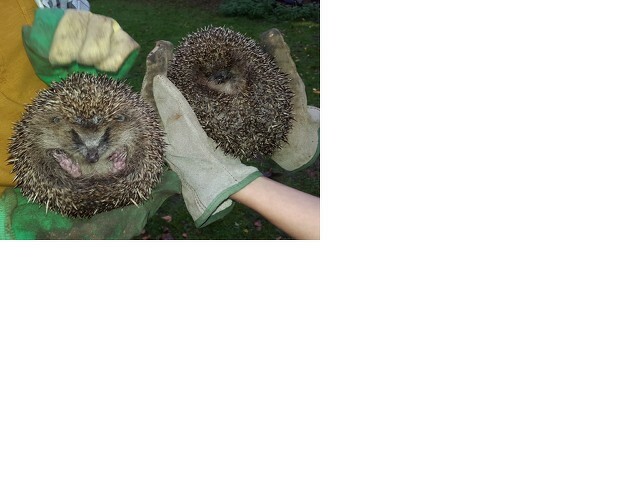 second pair we have had, they come from the hedgehog hospital in Shepreth. I built a big run for them so they stay penned up for 10 days then we lift the corner and they do as they will. Einspine and Zebedee hug around for another week or so. We took the pen round to the in laws and they have the next pair the other side of the paddock so there shouldnt be too much potential land clash if the first 2 are still near here. Einspine is a brilliant name! Mine was called Henry and I found him in the middle of the day wondering round and the vet told me to take him in and check him over. We had to put him in a covered box so he would go to sleep and put his medicine in his food and he got better really quickly but he had to live in my mum's room so that my cat Spanky wouldn't play with him. Then one 2am my mum state screaming that he was trying to climb into her bed and I had to take him out, we didn't know that they could climb!! I'd love to do that. I used to get loads of hedgehogs in my garden, probably attracted by the "Spikes Dinner" hedgehog food I put out. Loved seeing them but the past couple of years I've barely seen any round here and the two "hedgehog houses" I have in the garden don't look like they've been used at all this year. big problems with declining numbers at the moment apparently. Great picture. Yep already cut hole in the bottom of the fence to make my hedgehog corridor. I do listen when I watch Springwatch! We had one in the garden one year who sounded exactly like Rolf Harris. Thankfully, he behaved marginally better though he couldn't draw for pants. I think there may have been a children's TV programme a long time ago with hedgepig who was a hedgehog. Otherwise I've no idea either. Also Shakespeare calls baby hedgehogs "hedgepigs" in Macbeth. You can tell I'm bored being off work!